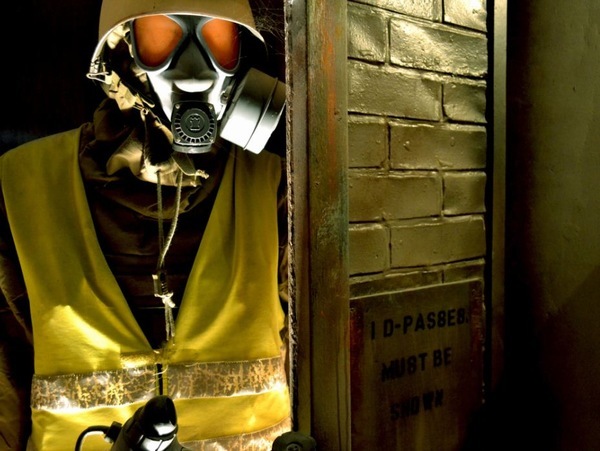 Bunker 51, a themed underground nuclear bunker located near The O2, North Greenwich, London specialising in Paintball, Laser Tag and Airsoft as well as immersive bespoke team building and scare events. Check out our famous Zombie SWAT Training event if you dare! 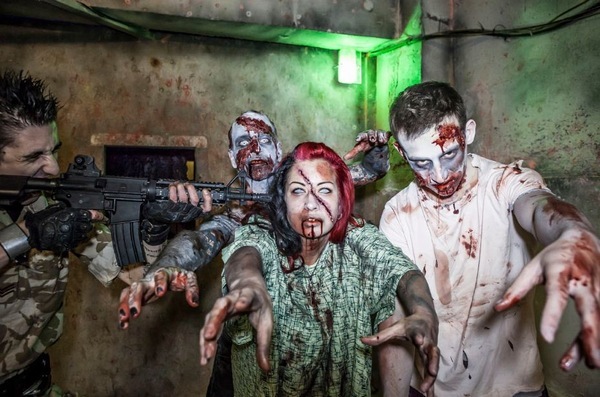 Bunker 51 is London's premier arena for realistic themed and interactive experiences. Gear up in military attire and familiarise yourself with the most technologically advanced weaponry available. We pride ourselves on providing unique events in our realistic military Bunker. Hide inside the prison complex, find the exit for the armoured truck and get ready for the missile launcher, all while hiding out underground. Bunker 51: Laser Tag and Paintball Nuclear Shelter... It’s a Blast! 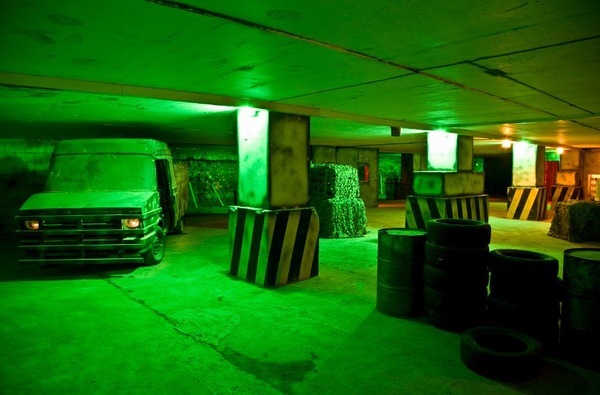 Paintball at Bunker 51: Why not try indoor paintball, available all year around at Bunker 51. Bunker 51 is one of the only sites in the UK to issue as standard a Smartparts Vibe, Semi-Automatic electronic marker, capable of firing as fast as you can pull the trigger! Super fast and super accurate, this kit is quite simply the best available. Our powder paintballs have also been specially selected for indoor use. As a result, they breaks on contact which minimizes impact and makes the game safer and more enjoyable, plus much less mess for just as much fun. We also a offer special Stag Party fancy dress box and a selection of Stag and Hen Party specialist games. Laser Tag at Bunker 51: Step inside the battlezone and play some retro laser tag at Bunker 51, this activity is suitable for groups of all ages. The latest technology to give you the most exciting gaming experience with various gun settings which allow you to use skill and stealth in your laser battle in our immersive arena with laser lighting to create surreal and stunning visual effects. We can cater for all group sizes with a selection of exciting team and solo games, perfect for the ultimate work tournament, end of term activity or kids party! Our trained marshals will kit everyone out in overalls, and army helmets for the full laser tag experience. 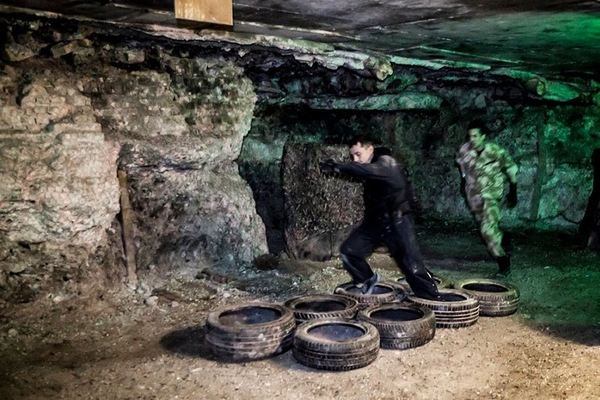 Children's Military Style Laser Tag or Paintball Parties: Join us in an exhilarating adventure through our spectacularly themed decommissioned nuclear bunker. 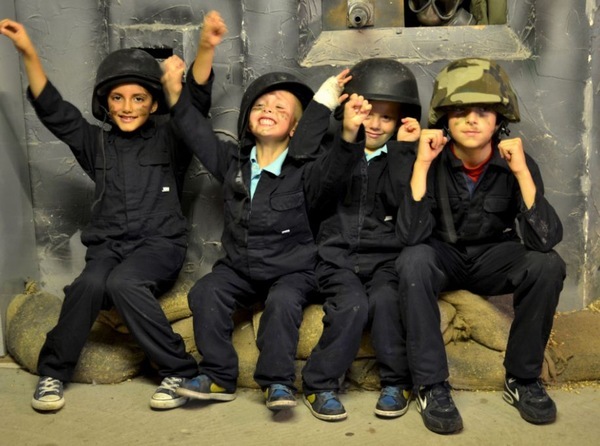 If you are looking to celebrate your birthday Bunker 51 style there are a wide range of options for you to choose from.Paintball for the over twelves or laser tag for ages six and over, whatever your age our in house party planners can help you choose the perfect kid's package to suit your needs. From themed cakes, party bags and a huge selections of party food options. Our Officer's Mess is the perfect backdrop to a military themed birthday party and with coordinated balloons, banners and table decoration all with a military style, let us make sure your party goes off with a Bunker 51 BANG! Zombie SWAT Training: AS SEEN ON TV. 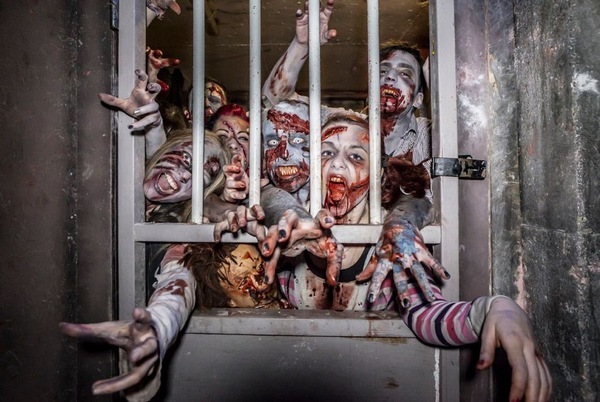 The Ultimate Zombie Fighting experience: The invasion has begun and soon London will be swarming with the UNDEAD. Step inside the battle zone; face your biggest fears and fight to save the world from imminent disaster.The end is near and you must learn how to survive. Luckily you are one of the selected few deemed worthy to undergo intense zombie survival training from our undead response unit. Not only will you get to handle at least 3 different types of weaponry, you will also be taught life-saving techniques in how to immobilise and destroy the zombie hoard. 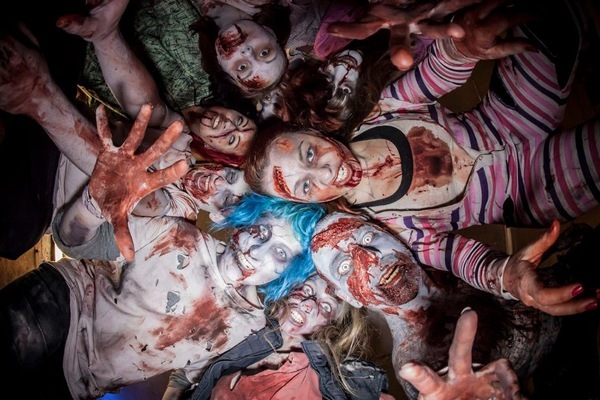 This fully immersive theatrical event will give you the skills to survive a Zombie Apocalypse. You must be physically fit, emotionally sound and ready to blow some zombie brains out! 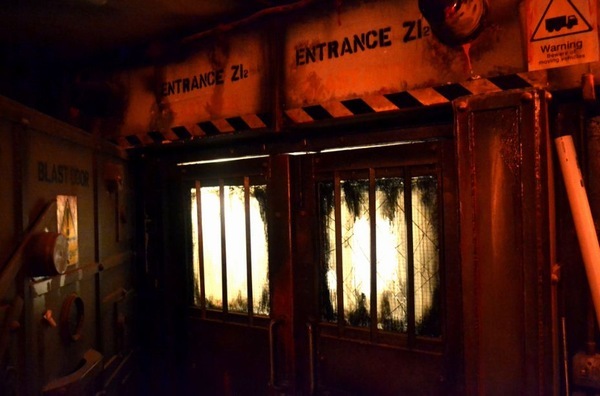 Zombie Blitz 1940: Waterloo Tunnels - London's newest zombie experience brought to you by Apocalypse Events at Bunker 51. Start your Sunday with a relaxing 1940's style tea party until your fun is quickly interrupted by the roar of air raid sirens...Take shelter as London, yet again, endures the wrath of the unrelenting bombers, and delve deep into the cavernous underbelly of a City under siege in World War 2 London. It is now in the hands of the British public and our new civilian soldiers to work together to unarm this biological hazard before our enemies can unleash havoc on the survivors and causalities of London’s Blitz. As this long and devastating war continues, new unthinkable threats appear. Recent intercepted communications from the enemies High Command has informed British intelligence that enemy Scientists could be working on terrifying new biological weapons, ready to reek indescribable horrors on an unsuspecting population, RIGHT ON OUR DOORSTEP! Step into 1940's Britain and let us take you an an immersive horror story adventure in the historical tunnels underneath Waterloo Station London. Ultimate Team Building Bespoke Events: Want a bit of everything? Undecided? Let our events team give you the ultimate team building experience, we can include everything from paintball, air soft, laser tag with a huge selection of fun and exciting team building activities on the side, why not test out our onsite assault course, play hide and seek with our night vision goggles and let us provide a selection of military actors to really immerse your group in the experience! These events can be completely bespoke depending on budget and can cater for 15-100 guests. We can even include our conference room, refreshments, or military truck pickup. We also have an onsite bar and kitchen so we can create a whole day of events for you. Just get in touch with our events team and let us create you a bespoke experience, ideal for team building corporate days, school groups or private parties. Our horror or gaming events can be recreated at any venue so why not hire some of our Zombies for Halloween?